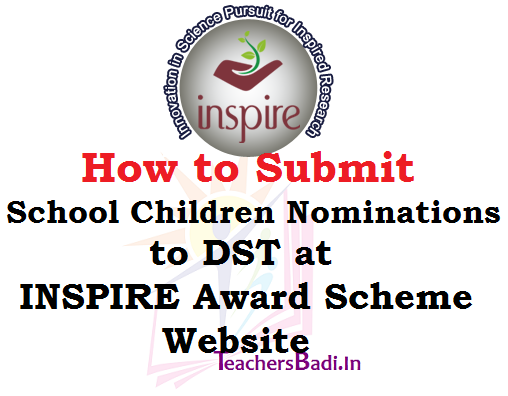 How to Submit School Children Online nominations to DST at INSPIRE Award Scheme Website, Submit nominations of eligible children to DST at INSPIRE Award Scheme Website, Register-School-E-Management-Inspire-Award-Scheme-Website-inspireawards-dst.gov.in: First go the website by entering the url address http://www.inspireawards-dst.gov.in/, then inspire award scheme official website will be opened. In this website, we can find the school authority in left side bar of this website and click on this link, then the following welcome page will be shown. SCERT Telangana: Implementation of INSPIRE AWARDS -MANAK - Opening of online system for nominations under revamped INSPIRE Award Scheme. The attention of all the District Educational Officers, Principals DIET, CTEs and IASEs in the state is invited to the reference cited, wherein Joint Secretary to GOI. DST, New Delhi has informed that the INSPIRE Award Scheme is being revamped under the name INSPIRE AWARDS - MANAK (Million MM. Augmenting National Aspiration and Knowledge) to align A with action plan for “Stan-up Ind, initiative launched by the Hon'ble Prime Minister of India.It A informed that, for this year, online nominations through E-Management of INSPIRE Award Scheme (E-MIAS) system A open to the all schools except earlier nominations which were made by the schools are of this academic year. The nominations will open from 01-04-2018. Submission of project synopsis (in word or PDF format) has now being made mandatory along with submission of online nominations. Registration of all unregistered schools at E-MIAS website (www.insnireawanis-dst.gov.in) may also be got expedited so that they too can avail the benefit of the scheme.Therefore all the DEOs in the state arc once again requested to take necessary action to enrol the schools and online nominations for this year . Further they are requested to give wide publicity through print, electronic media and other social networks to maximize the online nominations of INSPIRE Awards from the state.rk->Director, SCEllii tt(.4-ToAll the District Educational Officers in the state. Copy to the DIET, CTEs and IASE in the state. Copy to the Regional Joint Directors in the state. Copy to the Director of School Education for kind information.